A motion pad with vocal characteristics. Mod Wheel controls FXPingPong2Time. Use the Mod Wheel to add change speed and pitch of delays. I programmed “Crusher” so the patch works with it off and on. In the sample below, I use the same MIDI clip with Mod Wheel automation and record first with the crusher off and then with the crusher on. 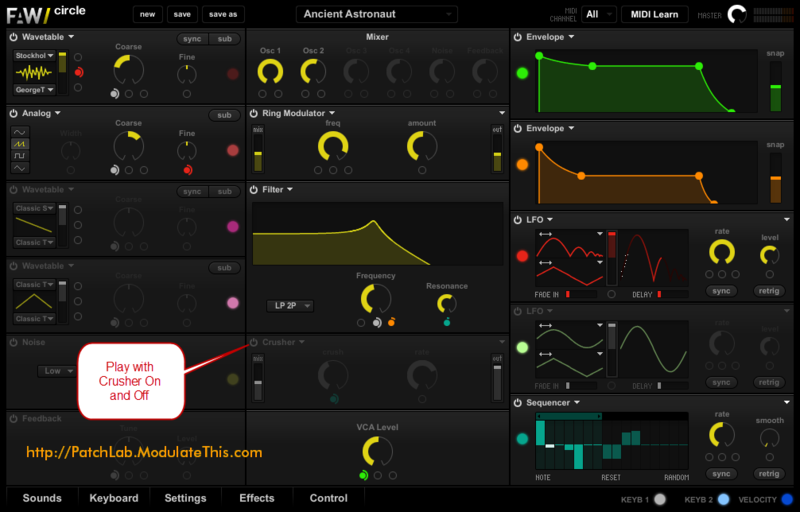 The Sequencer modulates resonance and bit crushing intensity. One reason I like using Circle is it’s really easy to route modulation and quickly grasp modulation routings. Just drop the colored circle from a modulation source and drop it on a modulation target. I left you a little home work this time. When you download the patch, you’ll notice that the patch responds with fixed velocity. To add keyboard velocity as a modulator for volume, drag the blue circle to the VGA Level source. You can change the intensity of the effect by following the instructions in the call out.